For the record, we do not eat a lot of processed food. Really, we don't. I make our bread, pasta, condiments, sauces, ice cream, tofu...you name it, I'm making it. I am a true believer in knowing what's in my food. The only way to do that, is to make it yourself. The only reason I 'm doing all these product reviews is because we were at the store and I thought, let's buy a variety of stuff. This way, if we need a quick weeknight meal, we won't need to get take out. It's hard to find vegetarian take out around here, even harder if you want vegan take out. 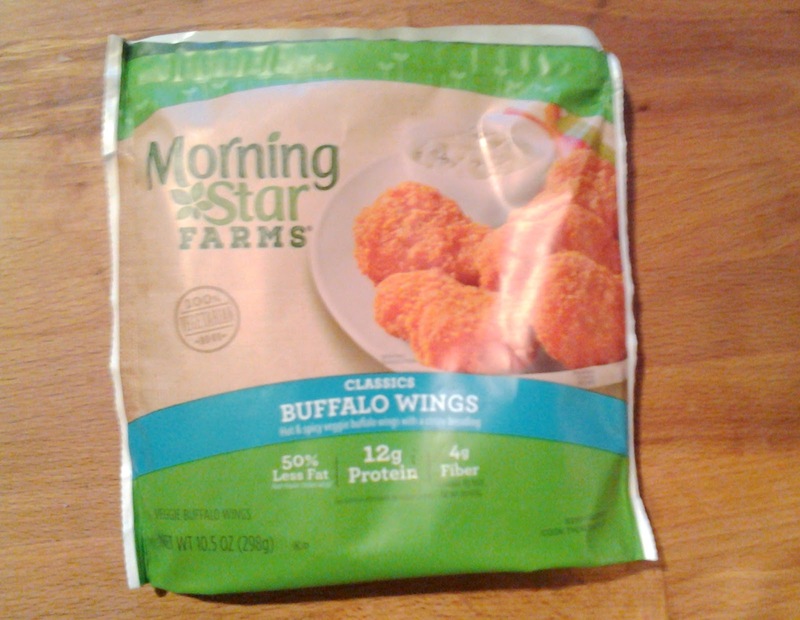 I had higher hopes for these Morning Star Farms Buffalo Wings....why don't they call them nuggets, I don't know....than I did for the Morning Star Farms Riblets. Considering they grind up chickens into a paste to make chicken nuggets, my guess is that starting with plant-based paste would be easy enough. Oh, you didn't know that's how they make chicken nuggets? Yeah....you really should paying more attention to what you're eating. I could do without the fake vomiting noises of this non-gory video, but it illustrates how gross chicken nuggets are. 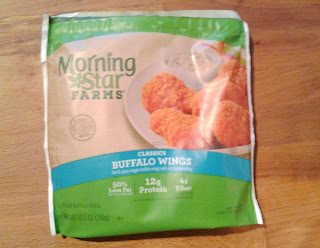 So back to the Morning Star Farms Buffalo Wings. They really do taste like chicken nuggets, but better. Probably because there's no ground up chicken bones and feet included....just saying. These were spicy, but not too spicy for the average American. I do like my wings sauced, so I had some weird buffalo sauce in my fridge, that while the color of wing sauce, somehow contained no butter. I don't usually eat it, it's more of my husband's thing. But I dunked these in that weird sauce, and voila! I was exactly what I would come to expect from a boneless chicken wing. UPDATE: No, I would not. I never realized how carefully you had to read labels. I took for granted that this product wouldn't have eggs or dairy, but apparently they do. Why would you put nonfat milk in chicken nuggets? Super disappointed Morning Star. I feel like I was bamboozled.